Hi, everyone! 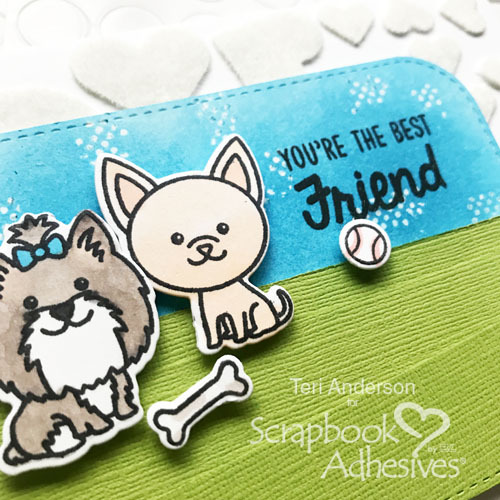 Teri here with a stamped card today that features fun textured inked sky that was easy to create with a little ink, cardstock and adhesive from Scrapbook Adhesives by 3L®. 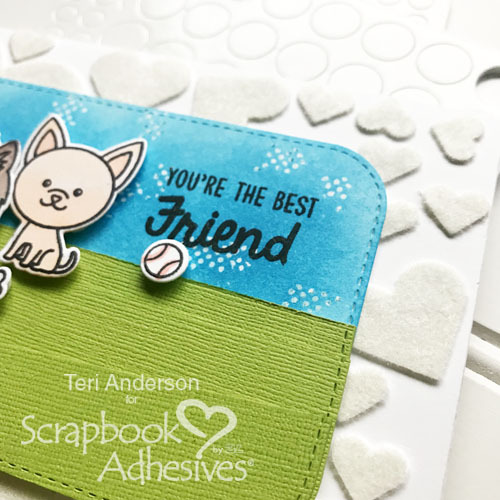 Start with a panel of white cardstock. 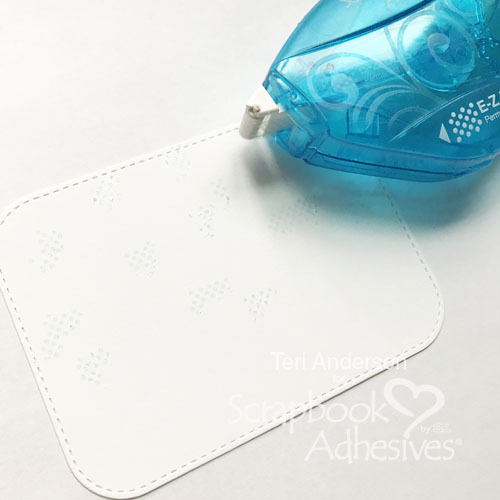 Use an E-Z Dots® Permanent Refillable Dispenser to randomly apply some dots to it. Make sure your dots are in small groups that are 1/2 inch to an inch long! Go longer and you’ll end up with lines in your sky! Take a blending sponge and cover it with blue ink. Slowly blend the ink in circles onto the panel. Apply the ink lightly at first. 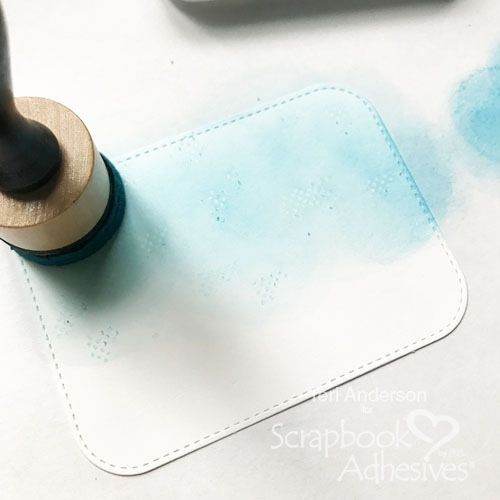 Keep adding on layers of ink to darken the ink up and expose the adhesive dots. 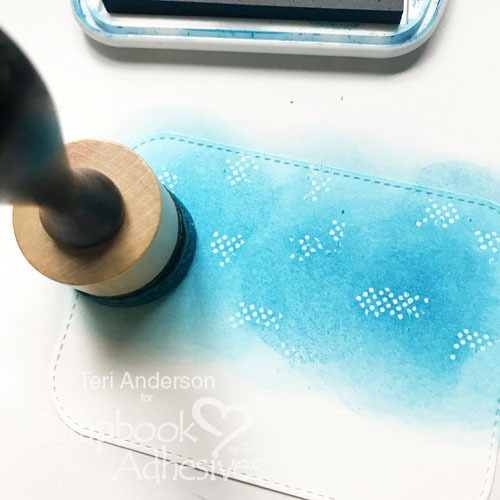 Once you’ve added as much ink as you desire, use your fingers (or a paper towel) to rub off the dots. You’ll end up with a cool textured ink sky! Once you’ve completed the panel, you can adhere it to a card! Want to kick things up a notch? Make a background on your card as I did! It’s easy! 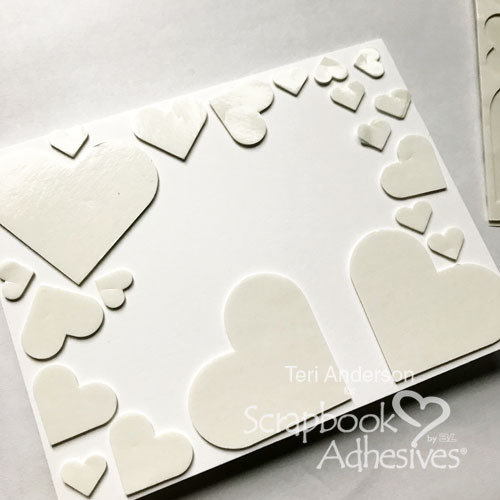 Grab some 3D Foam Hearts and randomly adhere them on the card. Don’t worry if they are all facing the same direction here. You are going for an unexpected but fun look! 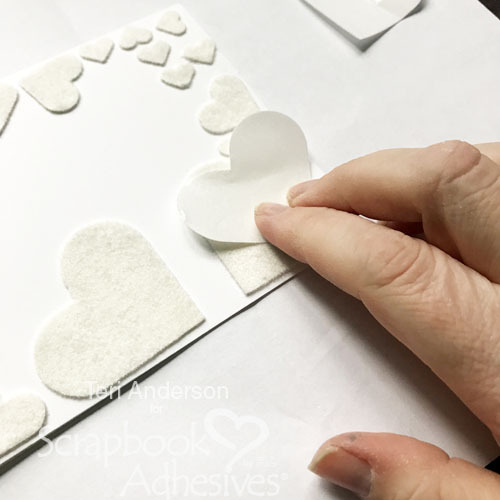 Remove the backing paper from the hearts. Dump flock onto them. 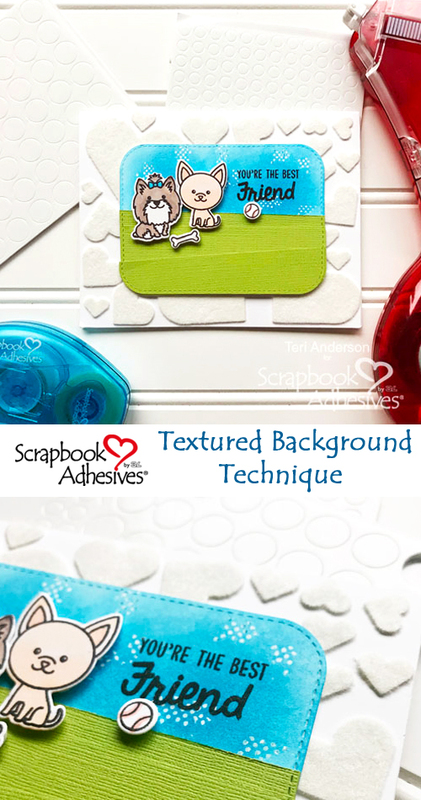 Push the flock onto the hearts to make sure they are covered completely with the flock. Remove the excess flock. 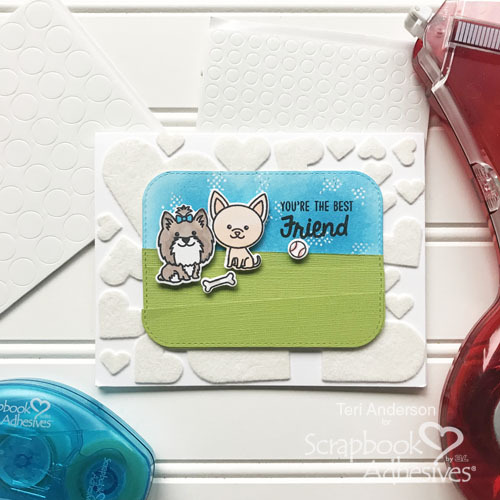 Once you’ve completed your flocked background, add the inked panel to your card. 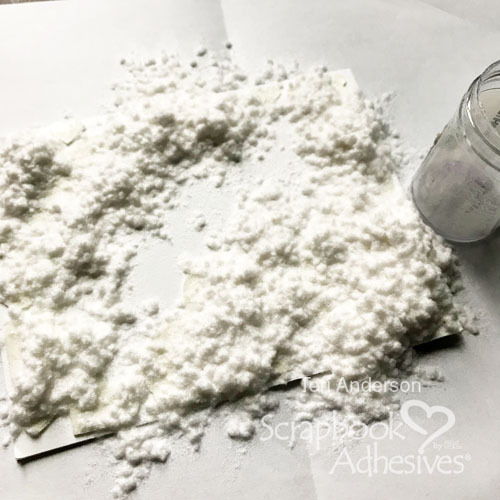 This entry was posted in 3D Foam Circles, 3D Foam Shapes, Adhesives, Beginner, Cards, Crafts & Tutorials, E-Z Runner® Dispensers, E-Z Runner® Grand, Permanent Adhesive, Skill Level, Tutorial, Wear your Adhesive on the Outside and tagged 3D Foam Circles White Mix, 3D Foam Hearts, E-Z Dots Permanent, E-Z Dots Permanent Refill, E-Z Dots Permanent Refillable, E-Z Runner Grand Dispenser, E-Z Runner Grand Permanent Strips Refill, Flock, Inking, My Favorite Things, Stampendous, Stamping, Sunny Studio Stamps, Teri Anderson. Bookmark the permalink.